Several weeks ago, NHL’s teacher asked me if I would go in this Wednesday to celebrate Chanukah with them. Wednesday they would celebrate Chanukah, Thursday Christmas, and Friday Kwanza. Each day they would do something special to celebrate and have a treat. Friday is also their End of Year celebration. They left it up to me on what to do. One of the teachers has been teaching kindergarten for quite some time and said she had many Chanukah sheets, crafts and items to use with the kids. I told her that I would go out and get each of the kids their own dreidel to take home. I asked about time to use the dreidels in school. She liked that and said she already had M&Ms to use. Since it was snowing and nasty in the morning, I sent in some items with NHL just in case I did not make it. The dreidels were already with his teachers, a musical/light-up menorah, and a CD with Chanukah songs (BNL of course). When JSL and I arrived at school, the kids were all sitting at their group tables working on sheets. Some were cutting and pasting, others coloring, and some using glitter (which is all over my jeans from sitting on the rug). Then I noticed there was a theme with the work. Everything had to do with Chanukah! Check out what came home with NHL, they are so neat. The one teacher explained that NHL showed his menorah in the morning and they had already talked about dreidels, read at least six books about Chanukah, and had listened to the songs I sent in several times. When the kids were finished and cleaned up, they met me on the rug. I showed them some of our giant stuffed dreidels, talked again about the Hebrew letters on them and what they mean in the game. 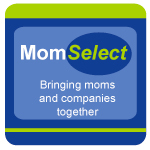 Then the kids were split up into groups, M&Ms given out and we played dreidel. I have to say it was interesting watching the kids in my group. Some felt that anything other than gimel was not good enough and tried to hide their spin off to the side and pick it up quick. 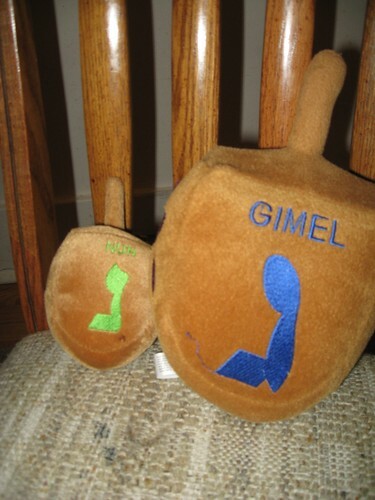 Of course, they would then proclaim they had gimel. This does not make for a very exciting game if everyone is constantly winning the pot of M&Ms in the middle. While the kids played, the classroom aid was busy frying up potato latkes. Earlier in the day, the class had made the recipe together. Once the game of dreidel was over, they had a chance to try a latke with apple sauce. I was so impressed! They honestly did not need me there, but it was sweet to be included. While the kids went to library, JSL stayed to play and I saw the huge rubbermaid container of Chanukah items that NHL’s teacher had collected over the years. It was amazing and possibly had even more than we have at home. Kudos to her for making sure that all of the holidays are represented so well. 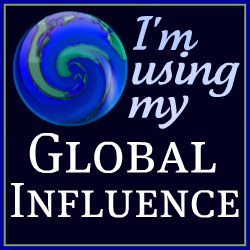 That’s very cool. Our daughter’s day care spent two weeks ago learning about Chanukah, last week Christmas and this week is Kwanzaa. Alex came home with a dreidel and a tiny menorah the other day. He wanted to know what the Hebrew characters meant to so I told him to ask our friends who are Jewish. 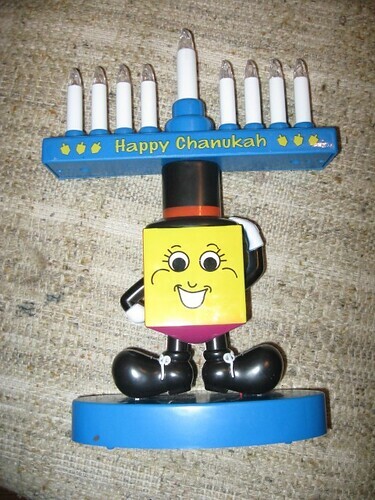 He also told me the middle candle on the menorah is the… “helper” candle, I think is the term he used. I taught the kids at our playgroup about Chanukkah. The kids are 6 and under with most being 3 and under so it was VERY simple. We “played” dreidle and I read a few stories and I showed them a menorah. They painted on dreidle shapes and were able to put paper flames on paper candles. It was fun though. I had to comment on this post. How wonderful it is to honor each others special days. My 6 yr olds teacher is Jewish & I’ve been so impressed by how she has incorporated Christmas & Chanukah into her lessons. 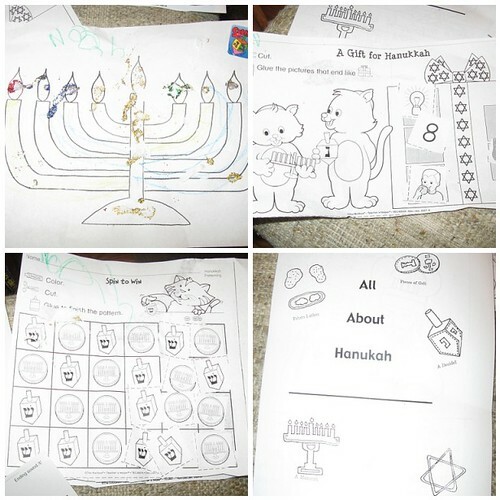 Sg has as many Chanukah worksheets (math & reading) as she does Christmas. I’ve already thanked my daughter’s teacher for this experience but I think you should be thanked as well for teaching another generation! I’ve also been extremely impressed w/ your patience as we’ve been doing Kailani’s Aloha Friday! So many Christmas questions & yet you’ve (I felt) very patiently reminded all of us that Chanukah is just as important! Afraid that Kwanza is just touched upon @ our school however! We’re a small farming type community & I don’t think anyone @ our school (public & grades k – 8) even celebrates it!